When you bring on new associates they are provided training and guidance to assure their success. Recruiting and hiring qualified personnel requires a sizable investment of time and resources. It is very much the same when implementing a new methodology or system into the organization, such as Six Sigma. Success is imperative and proper training is a vital part of achieving that success. Then why would you not provide training for your most important investment, your people? Quality-One can help with the development and implementation of Six Sigma methods and tools by providing Six Sigma Training. During an onsite Six Sigma Training event, one of our Subject Matter Experts (SME) will come to your facility to provide the training. This type of Six Sigma Training enables the teams to participate as a group. Onsite training is often more convenient for scheduling personnel and has proven to be a popular option for organizations that have multiple team members that require Six Sigma Training. The expenses are generally less compared to having the whole team travel. Quality One has Technical Training Centers in many convenient locations available for Offsite Six Sigma Training. The offsite training option is beneficial to companies with less than five associates that require a working knowledge of Six Sigma. Our training facilities provide participants an environment free from the distractions and interruptions of daily work activities, which increases knowledge transfer and encourages participation. During the discussion participants often share the unique challenges from their various industries. This interaction tends to keep interest and participation high. The Quality-One Six Sigma Online Overview option is completely interactive with audio, video, animation and downloadable reference materials. The online overview is ideal for busy individuals whose schedules prevent them from attending a traditional training session. 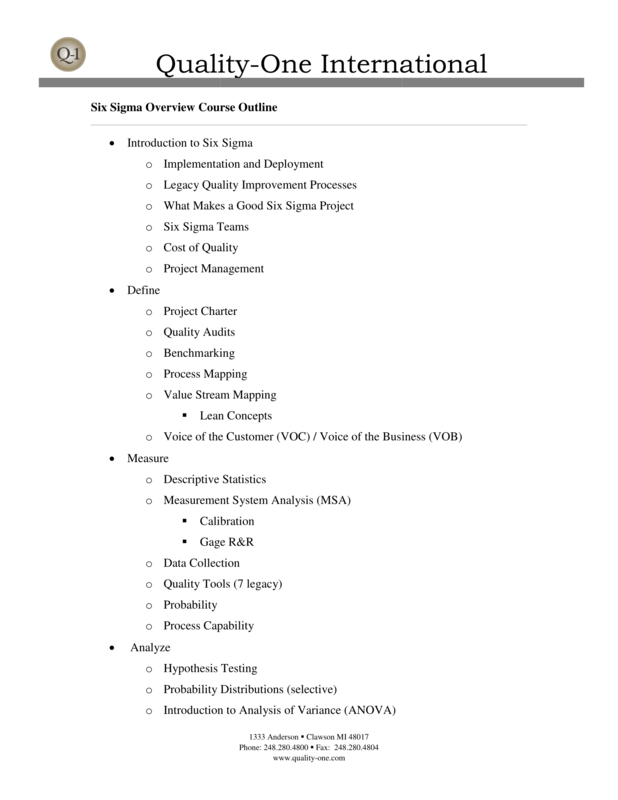 The module is self-paced and provides immediate access to Six Sigma content. The information is available 24 hours a day and the participant will have 30 days to complete the course.